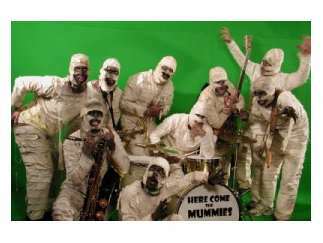 Not to be confused with The Mummies, the Bay Area garage band that was wearing mummy costumes in the early '90s. These guys are an eight-piece funk-rock outfit from Nashville, dressed as 5,000-year-old mummies, playing what they call Terrifying Funk From Beyond the Grave. (Or are they simply a Wrap group?) Since they were unearthed, they've opened for P-Funk, Al Green and Cheap Trick, rocked the Super Bowl Village, become regulars on "The Bob and Tom Show," and played a whole mess o' fests the last two years.